Bring a 5- to 6-quart pot of water seasoned with 1 tablespoon kosher salt to a boil. 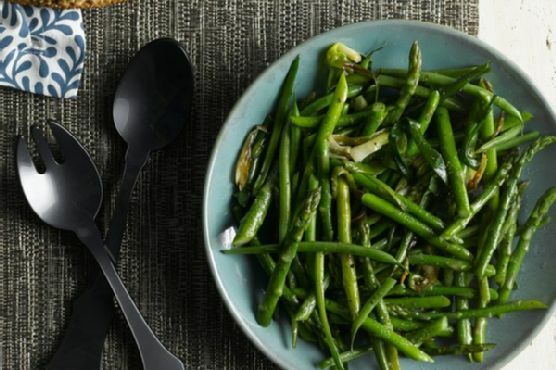 Cook asparagus and string beans until just tender, 5 to 6 minutes. Drain, then transfer in a single layer to paper or kitchen towels to dry. Separate white parts from green parts of scallions. Halve whites lengthwise. Halve green parts lengthwise and again in half crosswise. You should have approximately 3-inch pieces. Heat oil in a large, heavy skillet over medium-high heat until oil shimmers. Add white parts of scallions and saut until they just begin to wilt and turn golden, about 2 minutes. Add asparagus, green beans, and 1/4 teaspoon salt and saut to heat through, 1 minute. Add green parts of scallions and continue to saut until they just begin to wilt, about 1 minute more. Adjust seasoning if necessary and serve with a fresh grind of black pepper. Cooks' Notes:Vegetables can be cut and kept between dampened paper towels in sealable plastic bags 1 day prior to serving.